Apple VP of Advertising Platforms Todd Teresi in a keynote Q&A session at the Postback conference in Seattle on Tuesday explained the company's switch away from iAd in favor of the new Search Ads platform, revealed never before seen internal metrics and discussed the future of app advertising. 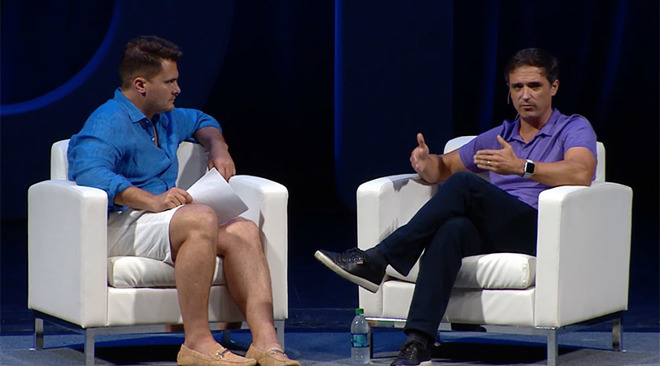 Apple VP of Advertising Platforms Todd Teresi (right) speaks with TUNE CEO Peter Hamilton at the Postback conference. Speaking with Peter Hamilton, CEO of ad measurement platform TUNE, Teresi said Search Ads now boasts an over 50 percent conversion rate, meaning more than half of the people who interact with iOS App Store ads download the target app. The statistic comes less than one year after Search Ads launched last October. As for the switch away from iAd, Apple's former advertising platform for developers that shut down in September, Teresi said the company decided to pivot in a new direction that made better use of its resources. Specifically, Search Ads was designed with app discovery and exposure in mind, benefits for both consumers and developers. Elaborating on the effectiveness of Search Ads, Teresi said Search Ads offers a level playing field for developers. More importantly, the platform incorporates an optimized relevance algorithm that boosts app discovery. "We take great pride in making sure that if you are searching on a specific type of app that someone from an entirely different genre or category can't come in, just because they have more money, and sit on that term," Teresi said. "Relevancy is the core. You don't even get into the auctions unless you first pass our relevancy bars." With the deployment of Search Ads, Apple is looking to bring install and engagement metrics available from services like TUNE more in line with those measured by the App Store. Using current third-party tools, advertisers measure ad performance by tracking installs, which are counted as the first time a user opens an app. There is a discrepancy between numbers gathered by attribution systems and those seen by Apple, as a portion of customers — 20 percent of installs on average, Apple says — opt in to limited ad tracking. Further skewing data are apps that are re-downloaded and opened for a second time. To help bridge the gap, Apple will work on providing install metrics and similar information to client attribution services. Like any Apple initiative, customer data privacy is of the utmost importance. "Trust is the important foundation of the industry," Teresi said. "We will work with TUNE to expose this information to help developers understand this." The data sharing will help developers better target consumers, and should lead to a better App Store experience for their customers. Teresi emphasized the goal off Search Ads is to cultivate discovery on the App Store. The company is looking to expand internationally this year, but only when it feels comfortable that the right product is ready for consumption. Following its U.S. debut, Search Ads launched in three English-speaking markets — Australia, New Zealand and the UK — in April.